Challenger Steve Hofbauer prevailed over incumbent Jim Ledford in Palmdale’s mayoral race. 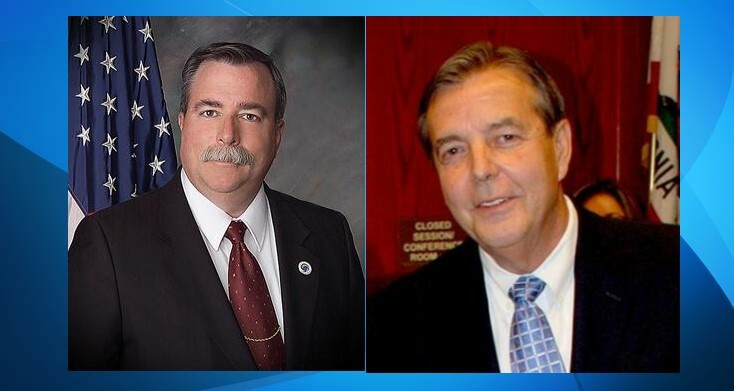 In the Palmdale mayoral race, Steve Hofbauer pulled off an upset over incumbent Mayor Jim Ledford. Receiving nearly 45 percent of ballots cast, or 10,631 votes, Hofbauer beat out Ledfords’s 8,502 votes, or 35.66 percent, according to the semi-final tally (with 100% of precincts reporting). V. Jesse Smith finished third in the three-way race, with 4,709 votes or 19.75 percent. Ledford’s 13th two-year term as Palmdale’s mayor expires this year. In Palmdale’s District 4 City Council race, incumbent Juan Carrillo Ventura prevailed over challenger Oscar Aleman. Ventura garnered 2,939 votes or 63.75 percent to Aleman’s 1,671 or 36.25 percent. District 3 City Council member Laura Bettencourt ran unopposed and received 4,051 votes. View the results of the Palmdale City General Municipal Election here. Democrat Katie Hill tentatively emerged victorious in her contentious bid to unseat Rep. Steve Knight (R-Palmdale) in the 25th Congressional District, which includes much of the Antelope Valley and parts of Ventura County and the Santa Clarita Valley. Hill received 83,662 votes (51.3 percent) to Knight’s 79,545 votes (48.7%), with an unknown number of ballots still to be tallied. Semi-official election results for the 23rd Congressional District race, which covers most of Kern County and parts of the Antelope Valley, including Lancaster, placed Rep. Kevin McCarthy (R) ahead with a tally of 89,568 votes (66.5 percent), leaving challenger Tatiana Matta, a Democrat, with 45,152 votes (33.5 percent). In the 36th State Assembly District race, incumbent Tom Lackey, a Republican, won 46,235 votes (56 percent) compared to 36,366 votes (44 percent) received by challenger Steve Fox, Democrat. View the full list of statewide election results here. In the Los Angeles County Sheriff race, Alex Villanueva received 820,333 votes (50.15 percent), taking a narrow lead over Sheriff Jim McDonnell, who received 815,406 votes (49.85 percent). That race is not over, as provisional ballots still have to be counted. The race for two seats on the board of directors for the Antelope Valley Health Care District, which manages Antelope Valley Hospital, showed the top two winners to be Phil Tuso at 32,525 votes (40.07 percent) and Don V. Parazo at 26,835 votes (33.06 percent). Michael P. Rives came in at 21,816 votes (26.87 percent). Measure H — which would authorize Antelope Valley Healthcare District to issue 30-Year General Obligation Bonds, not to exceed $350 million, to improve patient care, increase patient capacity, reduce Emergency Room wait times, and ensure the hospital meets California’s 2030 seismic earthquake safety — had a 61.54 percent “yes” vote against 38.46 percent “no” Wednesday morning. The measure needed a two-thirds vote, or 66.7 percent, to prevail. According to the Los Angeles County Registrar-Recorder/ County Clerk, 1,975,855 ballots were processed and counted, with 38 percent of eligible registered voters casting ballots. There are still many outstanding ballots to be counted, including provisional and Vote by Mail ballots received on Election Day. The RR/CC is tentatively scheduled to certify the election results on November 30. The Los Angeles County Board of Supervisors is tentatively scheduled to declare the election officially concluded on December 4. 30 comments for "Palmdale elects new mayor, other election results of interest to AV voters"
We need cooperation on a regional level, people! Enough squabbling between the cities. We get screwed enough as it is by everyone down-the-hill, it’s time to become a regional entity and hold more power. Great idea, were it not for the players involved. “We need local power” was the battle cry of the people who pushed Lancaster incorporation, but the power they really wanted was to get their greedy fingers into the pie. Those same people, or their inheritors, still hold all the power in Lancaster and are still only interested in stuffing as much pie as they can into their own greedy mouths. Unless you have some way to keep this regional entity out of their hands there is nothing gained by the more power that would be held. A ‘regional entity’ as defined by Rex and the Fern St. Mafia is we run the show, everyone else can go pound sand. No thank you to a ‘regional entity’ run by those morons. Why couldn’t perris be voted out!!! Because only 11.2% of the people voted. It’s not important enough for Lancaster residents to exercise their voting rights and vote Parris out. Wrecks and the Lancaster power brokers control the election process. They hold elections in April instead of November when most normal cities hold elections. Wrecks and the Fern St. Mafia want a low turnout that they can control. That is why they put voting stations in Lancaster Baptist Church and other churches that are under the control of Wrecks. They also reject voting districts so they can keep it majority west side rich Republican white males. They occasionally bring in a minority candidate who they control to make it look good. Until Lancaster changes to district voting and November elections expect more of the same. That is not why there is a low turnout. Voting stations in the churches! Wow. Low voter turnout is because of pure laziness, and apathy. Was the voter turnout higher this November or last April when Lancaster held its election? C’mon Alexis. I did not just fall off the turnip truck. I have been here in this cesspool call Lancaster for many moons. I would call you naiive, but that would not be fair to naiive people. You have been around. You should know better. Lancaster has been holding city elections in April for decades, AV Observer. Lancaster has been holding city elections in April for decades by design. Wrecks and the Fern Street Mafia control the outcome. It is all by design. Why else would not hold elections like every other normal city in November? Why else would they refuse to have district elections? Because they have full control, including control of counting those ballots on Fern Street. What could possibly go wrong with that? Well, JPB, Rex Parris hasn’t been the Mayor for decades. I guess every mayor that has been elected by the voters has been involved in corruption, and trying to keep the voters of Lancaster from voting. Anyway, Don’t you think if the city elections have been held in April in Lancaster Ca. for decades, that the people would know this? never mind, of course they know this, and don’t care to make changes in their lives. Don’t blame the mayor’s the people have elected, blame the people for electing them. It is so much easier for some people to keep complaining about As for Parris, well, obviously the people in Lancaster don’t care whether he is corrupt, because they refuse to vote him out. Sorry, No Excuses. I have been around Lancaster long enough to know that the April elections are by design. They count on voter apathy and avoiding the general election. It is a brilliant plan, really. It has allowed the Fern St. Mafia to operate under the radar for decades. With the demise of investigative journalism, their corruption train will keep on rolling. Your mind set and those that think like you are the problem. You absolutely can’t see that it is the people that have known for decades when city elections are, and refuse to go to the polls in April. Voter apathy is the voters fault, so you get what you deserve. I know many people that went to the polls to try to vote against Parris, but it’s people like you and some of the others with the same thinking, that just think lazy, and say what’s the use. The amount of voters that didn’t bother to vote is appalling, and you have only yourselves to blame. Every voter in Lancaster knows that city elections are held in April, and have been for DECADES. Other mayors before Parris were not doing his bidding, and were individuals elected by voters. read this again, elected by voters. Stop being paranoid! No excuses, you are trying to be satirical, but you have hit on the basic truth. A group of Lancaster businessmen looked at the unincorporated area of the county known as Lancaster and thought “hmmmmm, if we could get this incorporated as a city, and we played our cards right, we could turn it into our own cash cow and line our pockets!” That was the driving force behind the “incorporate Lancaster” movement for a couple decades, people resisted it, but they were relentless and they succeeded eventually because they were relentless, and they have been relentlessly milking their cow ever since. Wrecks is too young to have been a member of the original group. In fact it is unlikely that any of the original members of the group are still actively involved at their advanced ages. But the group still exists, still milks that cow, still relentlessly presses to extend their grip onto Palmdale, still uses the April elections to suppress any possibility of their grip being challenged…and is still one of the most grotesque examples of corruption in local government that can be found anywhere. No Excuses, it used to be that only the Lancaster voters were the stupid ones. Now Palmdale voters have joined them. Time to bail on the Antelope Valley. It was a good run and most of the people are nice. The Fern St. Mafia now runs the whole show. Goodbye. You’re wasting your time, no excuses. It’s like trying to convince “birther’s” that Obama was born in Hawaii. They will never see that it is the voters that elect the officials, therefore it is the voters that get what they deserve by NOT voting. Every mayor in the entire history of Lancaster has been milking the cow, and now these paranoid bumpkins think it is going to spread to Palmdale. Thank goodness more people see it differently than the few negative Nancy’s on here. Arnie Rodio, Frank Roberts, etc. ; all great mayor’s elected by the voters of Lancaster! No conspiracy here that started in 1977. What a bunch of nonsense. Parris is the only one that no one likes, and yet the voters do nothing! thanks all you lazy voters. Arnie Rodio was as crooked as Wrecks, and wasn’t even as subtle about it. He pushed for incorporation for years, and NEVER had a good reason for it other than his desire to spare his contracting business from interference. He didn’t even try to make one up, just figured if he kept pushing eventually he’d make it into the hen house. Frank Roberts wasn’t in my time, but I’ve never heard of a time since incorporation that the local good ol’ boys didn’t have enough dupes on the Lancaster council to have their way. Arnie Rodio was a good mayor, elected twice by the voters of Lancaster. Frank Roberts a good man elected by the voters of Lancaster. Thank you, no excuses for the truth. The voters are the ones that elect their politicians. Tim Scott and his opinions don’t matter. There has been plenty of corruption going on over many decades in Palmdale. Some are only obsessed with Lancaster. Palmdale is one of the worst cities in California, but you keep pointing those fingers at Lancaster. I just have to point out that using “good man elected by the citizens of Lancaster” as a defense has the obvious flaw that we all know the citizens of Lancaster have been totally duped by Wrecks, so their judgement in the past is inherently suspect. Palmdale has developed quite nicely, has a good credit rating, and seems to be pretty responsive to the citizens. Lancaster is a chaotic mess, running on junk bonds, and beyond about thirty good ol’ boys that get everything they want is totally unresponsive to the citizens. Yeah, I’ll keep pointing out the obvious…until Sellout Steve drags Palmdale down to Lancaster’s level, anyway. Frank Roberts wasn’t in your time? wow, you really don’t know what you are talking about. Palmdale is known for racist politicians, and corruption. You can’t point out the obvious, because you don’t know what that is. According to you the citizens of Palmdale don’t know what they’re doing either, except you of course. Thankful you sit at your computer most of the time, and you’re not out and about in Palmdale telling the citizens they don’t know what they’re doing, you know, face to face. Frank Roberts wasn’t in your time? Wow. Nope, he wasn’t. I left Lancaster for a decade to serve in the military. Sorry that offends you. Read the A.V. Times, April 2014. Read the A.V. Times, April 2018. Read what CAP’N LANCASTER has to say about all the lazy voters that were a no show. The people of Lancaster get the politicians they deserve. After all that Parris puts the people through, hit mailers, etc., and the people just give excuses, and complain. 19,000 Voters? That’s it? Guess the other 130,000 populace had better things to do on election day. VOTED OUT ALL THE SCUM THAT WORE THE MADE IN CHINA MAGA HATS.! People actually voted for Steve Fox?? 56 thousand people voted for Fox. That’s enough to make your snarky comment sound rather stupid. Katie says Hi!